vividly painted, with the Greek symbol lambda, featuring bright orange-red coloration with a darker lambda on its front and a black rim with wave patterns along its edges. A decorated variation of a traditional hoplon shield. 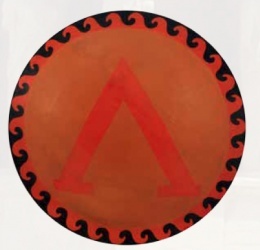 Emblazoned with the Greek symbol lambda, this shield is symbolic of Lacedaemon, better known as Sparta. The shield is a wood shield of classic Greek design. Being all wood and painted this shield a perfect practice variant for any Spartan warrior to handle, as well as a great shield for a Spartan helot to carry. vividly painted, featuring bright orange-red coloration with a darker lambda on its front, as well as a black rim with wave patterns along its edges. The reverse of the shield features cord bound to its edges, as well as a single central arm band, which allows the shield to easily be carried along for costume purposes, as well as easily hung for display. Laconia (Greek: Λακωνία), also known as Lacedaemonia, is one of the regional units of Greece. It is part of the region of Peloponnese. It is situated in the southeastern part of the Peloponnese peninsula. Its administrative capital is Sparta. The word "laconic" is derived from the name of the region by analogy -- to speak in a concise way, as the Spartans were reputed by the Athenians to do. This page was last modified on 1 May 2014, at 18:27.